Trade unionists objected to the IAG-owned carrier’s decision to enlist a third party for the service. AER LINGUS HAS been brought to the Workplace Relations Commission (WRC) over a decision to enlist a third-party firm to handle the return of items lost on aircraft and in its Dublin Airport lounge. In February, the airline started using a Dublin-based outfit called WeReturnIt, which returns lost items to passengers for a fee of between €20 and €60 depending on the item. 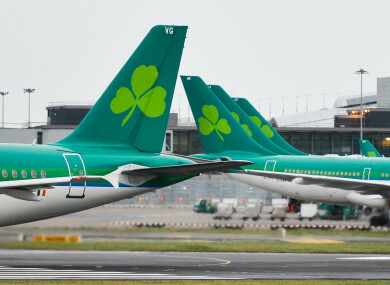 Trade union Siptu said the decision to outsource the lost property function has only directly affected a handful of workers but feeds into a wider, ongoing restructuring of Aer Lingus’s Irish workforce, which affects as many as 300 member-workers, according to organiser Neil McGowan. However, in response to a query from Fora, an Aer Lingus spokeswoman said the move hasn’t negatively impacted any staff and was introduced only to improve customer service. “Aer Lingus makes no money from this service, nor is it saving any cost, it is simply a means of increasing the quality of our service … Aer Lingus can confirm this decision has not negatively impacted existing staff members,” she said. Siptu’s aviation sector organiser, Neil McGowan, said the airline decided to enlist WeReturnIt because it had concerns “around data protection on phones”. McGowan said Siptu rejected this argument and was opposed to the decision to outsource the lost property function in the first place. Aer Lingus did not directly respond to Fora‘s query about potential data protection concerns. A meeting between Siptu and Aer Lingus took place at the WRC. An adjudication officer is due to make recommendation in the coming weeks. A number of changes have occurred in recent months at Aer Lingus, which was bought by British Airways parent IAG almost three years ago. In February, it was accused of trying to “overhaul and decimate” legacy contracts with long-serving staff after the carrier moved customer complaints jobs from Dublin to the US. It also set in motion plans to potentially move dozens of IT jobs out of the Irish capital. According to IAG’s most recent group traffic results, Aer Lingus carried more than 1 million passengers in the month of February. Load factor – a key measurement of the number of seats filled on an average flight – increased year-on-year by 1.2 percentage points to 71.2%. Email “Aer Lingus faces the industrial relations watchdog over its lost-property outsourcing ”. Feedback on “Aer Lingus faces the industrial relations watchdog over its lost-property outsourcing ”.